Bomb disposal. Not a job for the faint hearted. In September 2008 father of four Gary O’Donnell of the Royal Logistics Corps died in Afghanistan when an improvised explosive device went off as his team attempted to clear it. Gary had been awarded the George Cross for defusing bombs in Iraq in 2006. Even with protective suits and robots it is still a job for the bravest of the brave. In Coventry we are familiar with bombs. The city was subject to numerous air raids in the Second World War with the ‘blitz’ on November 14th 1940 being the most famous / infamous. Unexploded bombs from this period still turn up from time to time. I recall my late father telling me that in his youth he discovered an incendiary bomb near Canley Ford. As recently as March this year an unexploded German bomb was discovered during construction work on the new ‘Belgrade Plaza’. Large parts of the city centre were evacuated and then cordoned off as bomb disposal experts made the device safe. The bomb mentioned above was found in Upper Well Street, which is around a hundred metres or so from Chapel Street. On 14th October 1940 the 9th Bomb Disposal Company of the Royal Engineers were tasked with making safe an unexploded bomb in this city centre street. The 250 kg device had crashed through the roof of E Laxon & Co. Ltd, a food wholesaler, and ended up in the basement, where it was finally uncovered four days later. The bomb was fitted with standard fuses but these were so badly damaged they could not be removed. The electrical charge was thought to be dissipated but a discharge tool was applied just in case. It was believed the bomb was inert and could be moved so it was decided to transport the bomb to a disposal site on Whitley Common where it could be destroyed safely. The bomb was carefully loaded onto a truck and driven from town to the common. Tragically, as it was being unloaded, the bomb exploded without warning instantly killing seven men. As a child, the ITV drama series “Danger UXB” was compulsive viewing. The fictionalised exploits of bomb disposal men going about their business in WWII was mesmerising stuff. It could only give a taste of the danger faced by the real life bomb disposal teams but conveyed the terrors they faced and incredible courage very well. 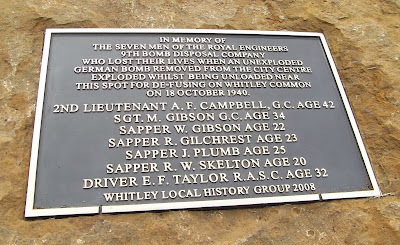 I had heard the story of the sad loss of life at Whitley Common when I was younger but not in any great detail. Now, thanks to tremendous work by the Whitley Local History Group, these seven brave men have been remembered with a permanent memorial. On the 18th of October 2008 the memorial was officially unveiled and dedicated on Whitley Common. I was privileged to witness the ceremony along with 150 or so others. Most of the crowd were older people and no doubt some had memories of that fateful day. As the sun struggled to break through the cloudy sky the Union flag was removed from the memorial stone by descendants of Sergeant Michael Gibson, George Cross, one of the victims of the explosion, and an old Sapper called Bill Cook who belonged to No. 69 Bomb Disposal Company which also defused bombs in Coventry in 1940. This was followed by the standard bearers from the Royal British Legion lowering their flags and the bugler sounding The Last Post. Sad, moving and poignant. A modern day aid for the current bomb disposal teams was on display – a robot made by local firm Remotec UK Ltd who coincidentally are based in Whitley! Back then the brave men who made safe Hitler’s deadly offerings had little to aid them and often had to rely on their wits and a stout heart alone. The memorial is located across the road from the entrance to the Ibis Hotel car park and is within sight of Whitley Abbey Bridge, another site that the Whitley Local History Group has commemorated with a plaque to mark its 250th birthday. 2nd Lieutenant Alexander Fraser Campbell, George Cross, Age 42. 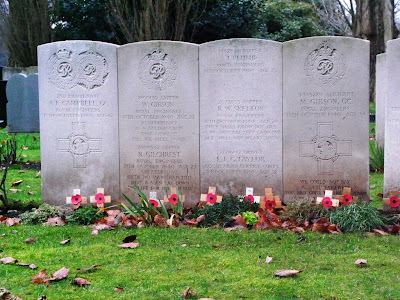 Sergeant Michael Gibson, George Cross, Age 34. Sapper William Gibson, Age 22. Sapper Richard Gilchrest, Age 23. Sapper Jack Plumb, Age 25. Sapper Ronald William Skelton, Age 20. Royal Army Service Corps Driver Ernest Frederick George Taylor, Age 32. The men are buried at London Road Cemetery, Coventry. The graves are located in the 'new' part of the cemetery and can be found around ten metres behind the monument in the Memorial Garden to the victims of the Coventry Blitz.